GameStop won't be carrying Medal of Honor in any of its store located on U.S. military bases, the company said, "out of respect for our past and present men and women in uniform." 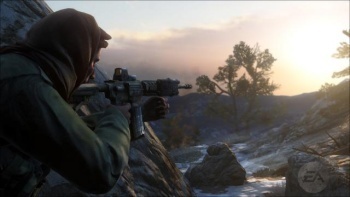 The inclusion of the Taliban as a playable faction in the multiplayer component of the new Medal of Honor has stirred up no small amount of controversy. Electronic Arts is sticking to its guns in the matter, albeit with a rather weak "it's only a game" justification, and most consumers will be able to pick up the game, Taliban and all, without any trouble when it comes out next month. But for gamers who also happen to be active members of the military, it'll be a trickier proposition. The Army and Air Force Exchange Services has said that the game will not be sold in any of the 49 GameStop stores located on military bases in the U.S., or in PX operations anywhere else in the world. Military personnel in the U.S. will still be able to pop down to the local mall and pick up a copy of the game but those deployed to places like Afghanistan and Iraq will simply have to do without. "Out of respect to those we serve, we will not be stocking this game," Army & Air Force Exchange Service Commander Maj. Gen. Bruce Casella told Kotaku. "We regret any inconvenience this may cause authorized shoppers, but are optimistic that they will understand the sensitivity to the life and death scenarios this product presents as entertainment. As a military command with a retail mission, we serve a very unique customer base that has, or possibly will, witness combat in real life. "GameStop has agreed out of respect for our past and present men and women in uniform [that] we will not carry Medal of Honor in any of our AAFES-based stores," the company said in an email. "As such, GameStop agreed to have all marketing material pulled by noon today and to stop taking reservations. Customers who enter our AAFES stores and wish to reserve Medal of Honor can and should be directed to the nearest GameStop location off base. GameStop fully supports AAFES in this endeavor and is sensitive to the fact that in multiplayer mode one side will assume the role of Taliban fighter." Kotaku has printed two interesting responses from members of the military, one supporting the decision and one opposed. A former combat medic who spent six years in the Army, including a deployment to Iraq, said the ban was a "shame" and that he found it offensive that the AAFES apparently believes that soldiers can't protect themselves from products that may be harmful; a member of the Air Force, on the other hand, wrote that PX/BX customers are "people who will be affected by a death in Afghanistan" and that keeping the game off-base is simply a matter of "trying to be sensitive to the pain of their patrons." Thanks to SmugFrog for the tip.